J.T. Bruett was in his first major league spring training in 1991 and he was taking the opportunity to learn about major league pitching, The Milwaukee Sentinel wrote. "In the major leagues you have to be much more selective at the plate," Bruett told The Sentinel. "They have a much smaller strike zone." Bruett wouldn't face major league pitching in the regular season that year, but he would the next. He would see it in 56 games with the Twins in 1992, and 17 more in 1993, marking the extent of his major league career. Bruett's career began in 1988, taken by the Twins in the 11th round of the draft, out of the University of Minnesota. At Minnesota, Bruett helped eliminate rival Wisconsin from the post-season that May, with three RBIs, The Associated Press wrote. With the Twins, Bruett started at rookie Elizabethton, hitting .297 in 28 games. He moved to single-A Kenosha in 1989, hitting .267 and stealing 61 bases. 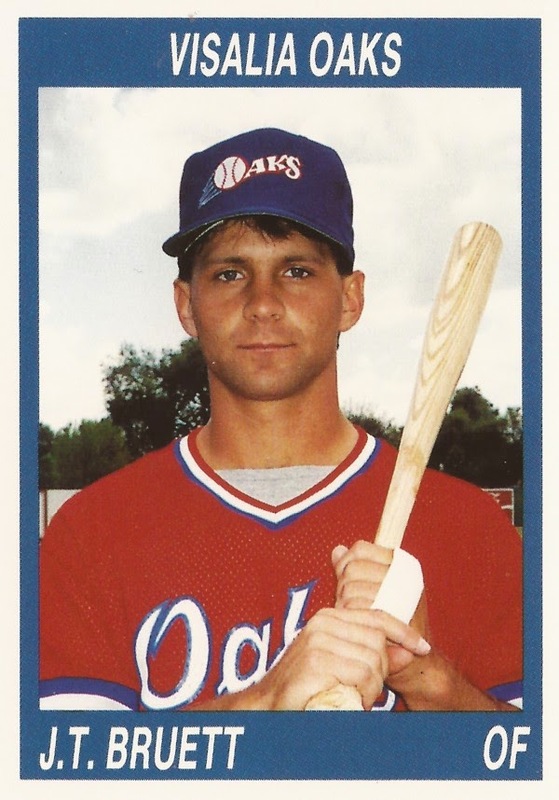 He then made the jump to AAA Portland in May 1990, playing 10 games, going 8 for 34 and stealing two bases. He then finished the year at high-A Visalia, stealing another 50 bases. After that spring in 1991, Bruett returned to Portland for the season, hitting .284 and swiping 21. He made his major league debut in June 1992. In 56 games for the Twins, Bruett hit .250, stealing six. He also bunted for a hit in a July 3 game. Bruett returned to Minnesota for a final 17 games in 1993, going 5 for 20, ending his big league career. Bruett finished out his career with two final seasons at AAA, with the Twins, Indians and Royals. His final playing time came in 1996, with the independent St. Paul Saints. Bruett has since returned to where he began, to the University of Minnesota, working in the school's athletic compliance department for the past decade. In 2007, he was named director of athletic compliance. In August 2011, Bruett told The Minneapolis Star-Tribune he works hard to ensure boosters, players and coaches know NCAA rules and stay within them. "I think you would be hard-pressed to find a student-athlete who says, 'Well, I just never really knew about that,'" Bruett told The Star-Tribune.